Of all the options and accessories to consider for your windows, the most important is really the most obvious, the glass. Accounting for up to 80% of a window’s real-estate, glass can make or break the overall performance of your system. The most unique attribute between our two Low E offerings is the Solar Heat Gain Coefficient (SHGC) or the amount of solar heat gain through the glass relative to the incident solar radiation (equal to 86% of the Shading Coefficient). Higher SHGC numbers provide natural energy in the winter to reduce heating costs, while lower numbers block heat gain in the summer to reduce cooling costs. Argon Gas is a colourless inert gas that is injected in the airspace of your insulating glass unit to improve energy efficiency. 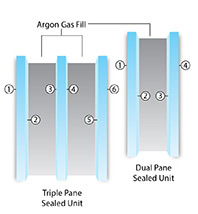 Argon is recommended with both Low E glass solutions and is a minimum requirement to meet Energy Star criteria. Note: Tdw-ISO represents potential fading damage caused by both UV and visible light. It is considered by the U.S. Department of Energy and the International Standards Organization (ISO) to be a more accurate barometer of fade resistance than UV transmittance alone. 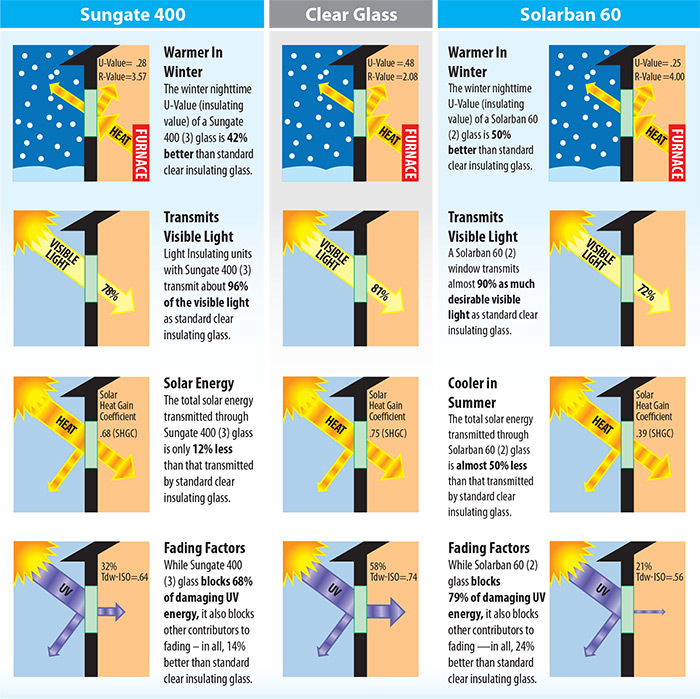 All comparisons are center of glass based on an insulating unit containing 3/4″ insulating units; two 1/8″ (3mm) glass lights and a 1/2″ (12mm) air-filled space for the standard clear insulating glass and argon gas-filled space for the Sungate® 400 and Solarban 60 insulating glass. Actual glass performance may differ due to glass thickness, gas fill and glass to frame ratio. Solar Heat Gain Coefficient (SHGC) is a ratio of how much solar heat is transmitted through the glass compared to 1/8″ (3mm) thick clear glass. (Lower numbers mean less summer heat). Figures may vary due to manufacturing tolerances. All tabulated data are based on the National Fenestration Rating Council (NFRC) methodology, using the Lawrence Berkeley National Laboratory’s Window 5.2 software. * Figures may vary due to manufacturing tolerances and controlled circumstances. The number in brackets indicates the position of the protective Low E coating; multiple numbers indicates a double application. All tabulated results are based on the National Fenestration Rating Council (NFRC) methodology, using the Lawrence Berkeley National Laboratory’s Window 4.1 software. * Comparisons are based on centre of glass measurements against a clear 3/4″ insulating glass units; two 1/8″ (3mm) glass panes and a 1/2″ (12mm) air space. 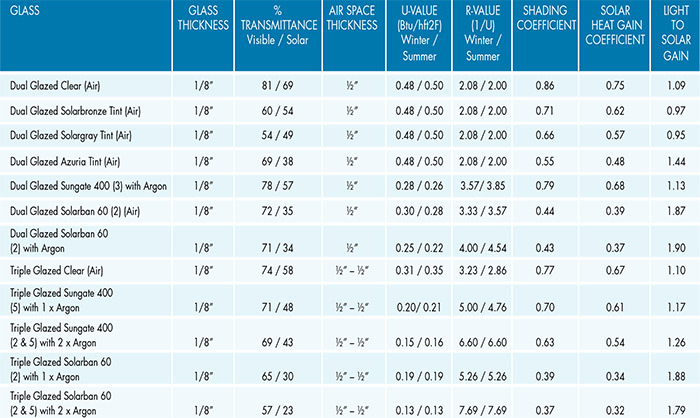 Actual glass performance may differ slightly due to glass thickness, gas fill, and glass to frame ratio. Clear glass allows 81% of visible light.